Croatia XI: Pletikosa, Pranjic, Perisic, Corluka, Lovren, Rakitic, Modric, Srna (c), Mandzukic, Olic, Sammir. Cameroon XI: Itandje, Assou-Ekotto, Nkoulou (c), Song, Moukandjo, Aboubakar, Choupo Moting, Chedjou, Mbia, Enoh, Matip. Dutch will switch to 4-3-3. Memphis Depay coming on means the Netherlands are reverting to a 4-3-3 formation. Blind LB, De Vrij and Vlaar CBs. Missed the first half... did the Dutch get caught looking past the Aussie's? Surprised 2 games Robben has played with 0 dives. Well here's hoping van gaal's tactical nous shows in the second! He mightve predicted australia will come out strong in the first, so maybe using that as an advantage in the second! 4-3-3 coming up! Big rumor right now - Ronaldo out of the WC. Big for US. Makr, unconfirmed, I should add. But he didn't look at all comfortable against Germany. Nani would be auditioning to play in the MLS !! Who'd have thought...the Dutch, conquerors of reigning WC and European champions, would be outclassed in just about every department by the Aussies in the first half. 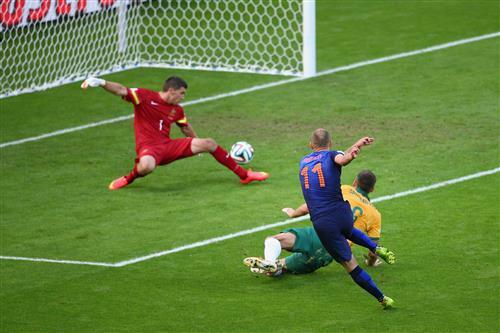 And, it's worth pointing out, it was the Dutch who scored against the run of play! except that portugal is a 1 man team, and that doesnt usually lead to wins in the world cup. @Deeks, Genuinely, I hope Ronaldo lasts that long and doesn't incur further knee injury. its portugal who should be afraid of the US... they were torrid against the germans. theyre missing half theyre back four and have no continuity. The US has lots of passion and support and will be full of confidence after beating ghana. Should Ronaldo even risk playing the next two games? As a football fan, I'd much rather Ronaldo bow out with a legit injury and heal up for the season than have him wreck his knee trying to achieve a Pyrrhic victory against the U.S. and Ghana. fitz no one fears the US at this tournament. hard to imagine why anybody would. Portugal aren't a one man team. Everybody just thinks that because of how special Ronaldo is. If Ronaldo played for the US, the US would be a "one man team." Soccer fans treat the US as if they are Malta or Kyrgyzstan. They are ranked 14th in the world. Not a team to be overlooked. In a different group, they are very likely to advance. Messi's goal deflected off of a defender. Wasnt as clean as i would of personally liked it. Cahill's volley definitely the best!! The guy isn't even left footed!!! Dutch side getting outplayed, who'd have thought?? Sturridge's goal was pretty good too! @DEEKS nicely put. Nani is awful. Which team is looking like a dud now that the first round of matches has been played?